RadioShack announced today that it will carry Barnes & Noble's Android-powered NOOK Touch, NOOK Color, and NOOK accessories in stores and online beginning Oct. 3. Prices will match those at Barnes & Noble, with the NOOK Simple Touch at $139 and the NOOK Color at $249. With new modifications daily and active developer support, the NOOK line has turned into an affordable option for those seeking a basic Android-powered tablet. You can check out our reviews of the Touch and the Color to decide whether to add one to your RadioShack shopping list, right below that remote control car you've been eyeing up. Hit the break for the full press release. NEW YORK--(BUSINESS WIRE)--Barnes & Noble, Inc. (NYSE: BKS), the world’s largest bookseller, and RadioShack (NYSE: RSH), an established authority in the wireless market, announced today they will be bringing the company’s award-winning line of NOOK eReading devices and related accessories to more than 3,000 RadioShack stores nationwide and online at radioshack.com, beginning October 3. Customers visiting a RadioShack or select dealer franchise location will now have access to a wide array of popular and innovative NOOK devices designed for readers of all ages. NOOK devices are the perfect choice for anyone who wants access to their favorite reads anywhere they go. Customers seeking a simple, easy-to-use, dedicated reading experience will love the NOOK Simple Touch Reader -- an ultra-light, portable 6-inch eReader with the most-advanced E Ink® Pearl display and the longest battery life of any eReader – all for just $139. With a simple tap, it’s intuitive and easy to navigate, shop and read. For customers who love to read everything in rich color, the NOOK Color features a stunning 7-inch VividView™ Color Touchscreen ideal for reading a wide variety of content including books, enhanced books, immersive children’s picture books, an expansive collection of interactive magazines, newspapers and more. The best value tablet at just $249, NOOK Color also offers the most-requested tablet features, including high-quality NOOK Apps™, built-in email, and an enhanced Web experience. With all NOOK products, customers gain access to shop Barnes & Noble's expansive NOOK Bookstore™ of more than two million digital titles, and the ability to enjoy content across a wide array of popular devices. For more information, visit www.bn.com/nook or visit any NOOK Boutique or display in one of Barnes & Noble’s more than 700 bookstores (http://store-locator.barnesandnoble.com). Barnes & Noble's NOOK brand of eReading products makes it easy to read what you love, anywhere you like™ with a fun, easy-to-use and immersive digital reading experience. With NOOK, customers gain access to Barnes & Noble's expansive NOOK Bookstore™ of more than two million digital titles, and the ability to enjoy content across a wide array of popular devices. The award-winning NOOK Color™ Reader’s Tablet™, the best-value on the tablet market ($249), features a stunning 7-inch VividView™ Color Touchscreen to read all of the content you love, shop popular apps, connect via email, browse the Web and more. The NOOK Simple Touch Reader™ ($139), is the easiest-to-use 6-inch touch reader, with the longest battery life of any eReader. In Barnes & Noble stores, NOOK owners can access free Wi-Fi connectivity, enjoy the Read In Store™ feature to read NOOK Books™ for free, and the More In Store™ program, which offers free, exclusive content and special promotions. Barnes & Noble was the first company to offer digital lending for a wide selection of books through its LendMe® technology, available through NOOK eReading products. 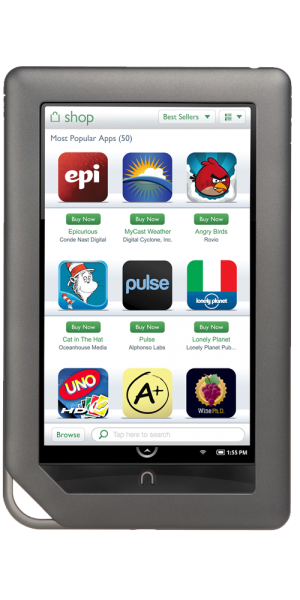 Find NOOK devices in Barnes & Noble stores and online at www.BN.com, as well as at Best Buy, Walmart, Staples, Books-A-Million, OfficeMax, Fred Meyer, and P.C. Richard & Son stores. In addition to NOOK devices, Barnes & Noble makes it easy for customers to enjoy any book, anytime, anywhere with its free line of NOOK software, available atwww.bn.com/freenookapps. Customers can use Barnes & Noble's free eReading software to access and read books from their personal Barnes & Noble digital library on devices including iPad™, iPhone®, iPod touch®, Android™ smartphones and tablets BlackBerry®, PC and Mac®. Lifetime Library™ helps ensure that Barnes & Noble customers will always be able to access their digital libraries on NOOK products and software-enabled devices and BN.com. Barnes & Noble also offers NOOK Study™ (www.nookstudy.com), an innovative study platform and software solution for higher education, NOOK Kids™ (www.nookkids.com), a collection of digital picture and chapter books for children, and NOOK Books en español™(http://www.barnesandnoble.com/ebooksenespanol), the first-ever Spanish language digital bookstore in the United States. For more information on NOOK devices and eReading software, updates, new NOOK Book releases, Free Friday™ NOOK Books and more, follow us on www.twitter.com/ebooksbn andwww.facebook.com/nookbn. Barnes & Noble, Inc. (NYSE:BKS), the world's largest bookseller and a Fortune 500 company, operates 704 bookstores in 50 states. Barnes & Noble College Booksellers, LLC, a wholly-owned subsidiary of Barnes & Noble, also operates 635 college bookstores serving over 4.6 million students and faculty members at colleges and universities across the United States. Barnes & Noble conducts its online business through BN.com (www.bn.com), one of the Web's largest e-commerce sites, which also features more than two million titles in its NOOK Bookstore™ (www.bn.com/ebooks). Through Barnes & Noble’s NOOK™ eReading product offering, customers can buy and read digital books and content on the widest range of platforms, including NOOK devices, partner company products, and the most popular mobile and computing devices using free NOOK software. NOOK Simple Touch Reader™, NOOK 1st Edition™, NOOK 1st Edition Wi-Fi™, NOOK Color™, Reader’s Tablet™, Fast Page™, NOOK Books™, NOOK Bookstore™, NOOK Newsstand™, NOOK Magazines™, NOOK Newspapers™, NOOK Apps™, PubIt!™, NOOK Kids™, Read In Store™, More In Store™, NOOK Friends™, LendMe®, NOOK Library™, NOOK Boutiques™, The Barnes & Noble Promise™, NOOK Books en español™, NOOK Study™, Free Friday™, Lifetime Library™ and Read What You Love. Anywhere You Like™ are trademarks of Barnes & Noble, Inc. Other trademarks referenced in this release are the property of their respective owners. Follow Barnes & Noble on Twitter (www.bn.com/twitter), Facebook (http://www.facebook.com/barnesandnoble) and YouTube (http://www.youtube.com/user/bnstudio). RadioShack (NYSE: RSH) is a leading national retailer of innovative mobile technology products and services, as well as products related to personal and home technology and power supply needs. The Shack® offers consumers a targeted assortment of wireless phones and other electronic products and services from leading national brands, exclusive private brands and major wireless carriers, all within a comfortable and convenient shopping environment. RadioShack employs approximately 33,000 people globally, including a team of friendly and helpful sales experts who are recognized for delivering the best customer service in the wireless industry. Based in Fort Worth, Texas, RadioShack’s retail network includes approximately 4,675 company-operated stores in the United States and Mexico, more than 1,475 wireless phone centers in the United States, and approximately 1,140 dealer outlets worldwide. For more information on RadioShack Corporation, please visit www.radioshackcorporation.com; to purchase items online, please visit www.radioshack.com. RadioShack®and The Shack® are registered trademarks licensed by RadioShack Corporation.